How to Can Cherries at Home, Easily! Please tell the farms you found them here - and ask them to update their information!!! Cherries have such a brief season of availability fresh that it's a shame to miss it and have to rely on store bought for the rest of the year! Instead, you can easily can (or "put up") from cherries that you pick or buy fresh. And if you want to make your own cherry pie filling in advance, see this page for those directions! We'll use the "hot pack" method here, in which the cherries are heated briefly (for 5 minutes) with the hot syrup) as this preserves the color and flavor better than the "raw pack" method! Ingredients and Equipment: What will you need? 18 pounds of cherries to make one canner load of 7 quart jars. 12 pounds to make a canner load of 9 pint jars. Also, if you buy the cherries at a farmer's market, a "lug" weighs 25 pounds and usually yields 8 to 12 quarts. Water, fruit juice (such as apple juice or white-grape juice), or sugar or sweetener syrup solution. Look for bright, uniformly-colored cherries that are ripe, but not mushy. If the taste good to you, then , they're right! 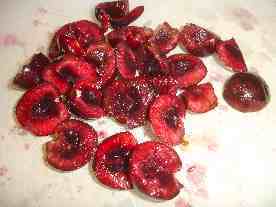 Pull the stems off and wash the cherries in cold water (no soap!). Remove the pits, if desired (it helps a LOT to have a pitter). Canning jars in the dishwasherNow's a good time to get the jars ready, so you won't be rushed later. The dishwasher is fine for the jars; especially if it has a "sanitize" cycle, the water bath processing will sanitize them as well as the contents! If you don't have a dishwasher with a sanitize cycle, you can wash the containers in hot, soapy water and rinse, then sanitize the jars by boiling them 10 minutes, and keep the jars in hot water until they are used. Leave the jars in the dishwasher on "heated dry" until you are ready to use them. 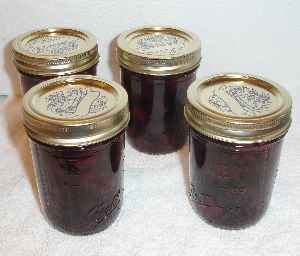 Keeping them hot will prevent the jars from breaking when you fill them with the hot syrup solution. Pit the cherries, if you like them pitted! If you pit the cherries, place the cherries in water with some Fruit Fresh (or other ascorbic acid )to prevent stem-end discoloration. If you can't get hold of Fruit Fresh, 2 or 3 tablespoons of lemon juice will do an ok job! 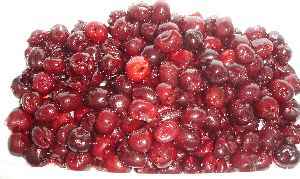 If you are canning the cherries unpitted, prick the skins on opposite sides with a clean needle (or fork) to prevent them from splitting. 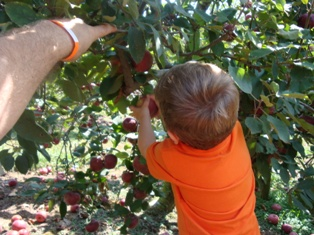 If you have a cherry pitter, now's the time to pit them! BEST PITTERS AVAILABLE: Leifheit Pitter and the Norpro Deluxe Cherry Pitter. These things are amazing; easy fast and reliable. The Norpro can handle larger volumes of cherries reliably! I can pit a cherry per second. The Leifeit is even better, as it is larger! See these videos about setting up and using the Norpro Deluxe Cherry Pitter, to see just how easy and fast it is. Cherries may be canned in water, fruit juice (such as apple juice or white-grape juice), or syrup. It normally takes about 1/2 cup of liquid per jar. For directions on how to prepare these syrups, see this page! That's all there is to it: fill each jar to within 1/2 inch from the top. 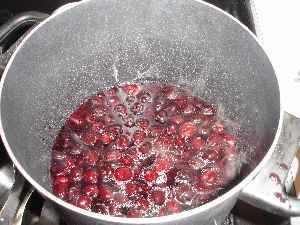 you may want to ladle the cherries with a slotted spoon into the jars first, then pour the hot syrup over them. Tap the jars gently free any trapped air bubbles. You may also slide a clean table knife inside the jar and stir gently to release trapped air bubbles. Put an unused lid on the jar and gently tighten (not too tight) the ring down around it. How long to process the jars in the boiling water? It depends upon the type of canner you have and your altitude. Most people use a simple boiling water canner - see table 1. This works fine for cherries. 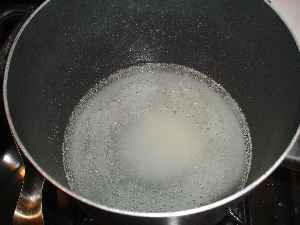 In this type of canner, most people will be boiling the jars for 15 or 20 minutes. For pressure canners, see tables 2 and 3 below! Table 1. 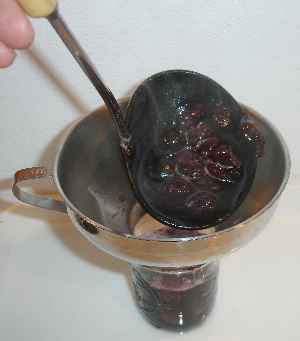 Recommended Process Time for Sweet or Sour Cherries, Whole in boiling-water canner. You may want to try raw pack method if you have a pressure canner, since the cherries will be exposed to higher heat for a longer time. Table 2. 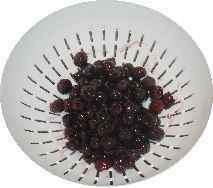 Process Times for Sweet or Sour Cherries, Whole in a Dial-Gauge Pressure Canner. Table 3. 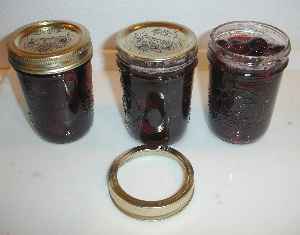 Process Times for Sweet or Sour Cherries, Whole in a Weighted-Gauge Pressure Canner. 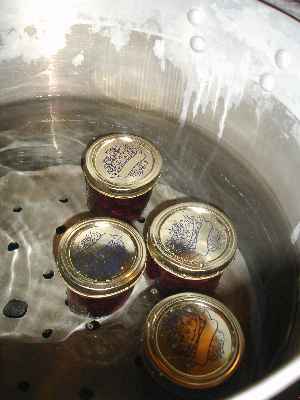 Once the processing time is complete, just ift the jars out of the water and let them cool without touching or bumping them in a draft-free place (usually takes overnight) You can then remove the rings if you like, but if you leave them on, at least loosen them quite a bit, so they don't rust in place due to trapped moisture. Once the jars are cool, you can check that they are sealed verifying that the lid has been sucked down. Just press in the center, gently, with your finger. If it pops up and down (often making a popping sound), it is not sealed. If you put the jar in the refrigerator right away, you can still use it. Some people replace the lid and reprocess the jar, then that's a bit iffy. If you heat the contents back up, re-jar them (with a new lid) and the full time in the canner, it's usually ok.
Of course, if you are using a pressure canner, wait until it cools down and the pressure is released before opening it!